For groups larger than 6 people, please call the hostel at (713) 636-9776. 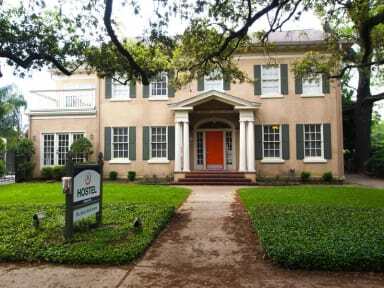 HI-Houston: The Morty Rich Hostel is the only hostel to offer 24 check-in, outdoor swimming pool and full-sized pool table. We also offer free WIFI, a computer with free internet access, onsite laundry, free parking, free boarding pass printing, 24 hour access to the common areas and kitchen and a complimentary breakfast! HI-Houston is located on a beautiful tree lined boulevard in the diverse and funky neighborhood of Montrose. We are within walking distance of some of the best bars, restaurants and coffee shops in Houston. Coming to Houston for a conference? We are located 2.5 miles from the George R. Brown Convention Center. Whether you are coming to Houston to relax, party or work - there is something for everyone! 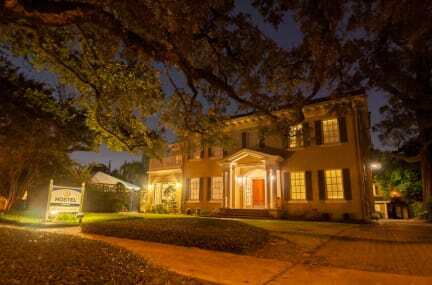 The hostel is housed in a beautiful historic mansion once owned by a City of Houston Mayor. Our 4 bed coed dorm and 6 bed female dorm offer private balconies. Beginning April 1st, our deluxe 6 bed dorm will be located in the back carriage house and will also offer a private patio. We will also be opening our deluxe private room. The private room is located on the 2nd floor of the carriage house and offers a queen size bed, mini fridge, large bathroom and separate seating area. Even better, it has its own private patio. Whatever your budget, HI-Houston has something to fit. Our kitchen is stocked with all the stuff you need, but never want to buy while traveling. We have olive oil, spices, pasta, rice and flour at your disposal. We also have complimentary tea and coffee available to our guests at all times. Our staff is friendly and helpful! We may not know everything, but whatever we don't know we will happily look up for you! Come stay with us and let us show you what the nations 4th largest city has to offer! Hotel occupancy tax of 17% is not included in your total quoted will be added to your bill upon arrival. Rates quoted assume guests are members of HI-USA or a National Youth Hostel Association. Non members will have a daily membership charge of $4 per person, per night added to their bill upon arrival. Guests also have the option of purchasing an annual memberships at the hostel. We have a 14 day max stay policy. Guests can stay at our hostel for 14 nights within a 60 day period. After the 14 days have been reached, the guest must wait at least 60 days before staying at the hostel again. HI-Houston cannot accommodate guests who reside in Houston or the nearby surrounding areas. United States citizens are required to show a drivers license or government issued identification card at check in. U.S. Passports will only be accepted if the guest is able to provide additional documentation that they do not reside in Houston or the nearby surrounding area. Hostel check-in is at 3:00pm. If you are arriving earlier than are regular check in time, you are more than welcome to come in the hostel and relax until your room is ready. We will try in get you into your room as soon as possible. Hostel check-out is at 11:00am. If you are leaving Houston, we would be happy to store your bag until you are ready to go. All minors, 17 and under, must be accompanied by a parent or legal guardian. Unfortunately, minors cannot be accommodated in shared dormitories. Groups over 8 people must call the hostel to make a reservation. This has been an amazing opportunity to try a new way to travel. I also had the opportunity to build solid friendships from individuals across the world. My only request is to have new pool sticks to play pool. The 5 that are there all have broken tips. I want to stay in this hostel every time I come to Houston! It's cleaner than many more expensive hotels I've stayed at and it has 1,000% more style. I loved sitting on the sofas in the common areas to hang out with the other guests, and I loved laying outside by the pool or in one of the hammocks. Excellent, relaxing, clean, comfortable and friendly old house hostel with a beautiful charm. Easy bus ride to town from a close bus stop and the staff go out of their way to assist with any questions. Breakfast is good and all kitchen appliances required to cook up your own lunch or dinner. Everything's OK. The location is in beautiful residential area in midtown but rather far from the centre and the public transportion is poor. The staff is very friendly, as well as the breakfast (including eggs and fruits). Really cool place. I enjoyed staying here so much I stayed on for a second night. I will definitely come again. Enjoyed my stay. Attentive and helpful staff, comfortable accommodations, close to public transportation. Breakfast was cereal, fruit, package oatmeal,, coffee and tea. It's a basic but good hostel, pretty much applies you get for what you pay.